“Distractions” …some time ago I set out on a journey to better understand how we came to have the books that make up our New Testament. Having now chased enough rabbits with Alice, I hope to return to this effort. Interestingly, A New, New Testament has made its debut, escalating my interest even more in these matters. Do you think stuff like this opens the door for some serious confusion for lay persons as myself when we’re out shopping for a Bible? It includes works such as The Gospel of Mary, The Prayer of the Apostle Paul, and The Acts of Paul and Thecla. Here’s the book’s description offered at Amazon. “It is time for a new New Testament. Over the past century, numerous lost scriptures have been discovered, authenticated, translated, debated, celebrated. Many of these documents were as important to shaping early Christian communities and beliefs as what we have come to call the New Testament; these were not the work of shunned sects or rebel apostles, not alternative histories or doctrines, but part of the vibrant conversations that sparked the rise of Christianity. Yet these scriptures are rarely read in contemporary churches; they are discussed nearly only by scholars or within a context only of gnostic gospels. Why should these books be set aside? Why should they continue to be lost to most of us? And don’t we have a great deal to gain by placing them back into contact with the twenty-seven books of the traditional New Testament—by hearing, finally, the full range of voices that formed the early chorus of Christians? “Reinvigorate? Bring new relevance?” Really? 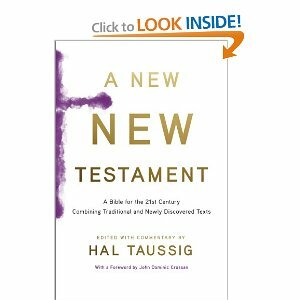 Dr. Jim West, Zwinglius Redivivus, in a post found here, has these kind words to say of Mr. Taussig’s questionable contribution to the New Testament. He has more to say, but with me being one of those detested biblio-dilettantes, I think I’ll encourage you to travel to his place and read for yourself. Joel Watts, Unsettled Christianity, being a tad friendlier has this to say. “I am going to tepidly recommend this book, but only if you take it as a patristic learning tool and not in any sense as how it is presented on the back cover.” His is a pretty formal review of the product and is worth taking a moment to read. You can find it here. This entry was posted in Books, WordPosts and tagged Christian, Christianity, Early Christianity, Gospel of Luke, Gospel of Mary, Hal Taussig, John, Letter of Peter to Philip, New New Testament, New Testament, Prayer of the Apostle Paul. Bookmark the permalink. 10 Responses to Reloading the Canon? I believe God has set His seal on the 66 books of the Bible which He has preserved so diligently over the centuries, and I accept them as truly the Word of God. I do not believe these can be added to. The ‘extra’ books might be worth reading and could be useful for discussion, but I would hope no one would suggest they are on the same level as the Word. Old is not necessarily better, and new is not necessarily better…truth is better. “What is truth?” was famously asked many centuries ago by someone standing in the very presence of Truth. It is still asked today. The early church was wary of “new” ideas, novelty usually…(maybe always, but I don’t have time to check) …was heresy. Now we seem to be in a society that doesn’t like anything “old”, we have to be “radica-ly new”. Which I find somewhat amusing as the word radical means coming from the root…and that would NOT be new. I read a quote by a 16th century Anglican, L. Andrewes, who defined orthodoxy as “One canon, two Testaments, three creeds ], four councils, and five centuries along with the Fathers of that period.” 1-2-3-4-5…I like anything that is easy to remember…but I like even more that it is “radical”, it goes down deep, and back, to the roots. Too many times we have no idea what is, and isn’t, orthodox. All truth is God’s truth…I encourage discipleship of the brain in seeking knowledge…but I also encourage comparing everything to the ruler we already have. Sift everything through The Word already determined to be orthodox, and enjoy the literature. I would. Indeed. The literature is fun indeed. Not sure how many are familiar with “The Acts of Paul and Thecla (the only one of the ten I’ve managed to get into as of yet), but in this interesting story, some of those single sentence statements by Paul in his letters are elaborated on. Such as those about Demas and Hermogenes. In this story, their treachery plays out in the form of turning a young man against Paul by feeding him full of lies about his betrothed and about Paul. Is it true? I’ve no idea, but it is a fascinating encounter no doubt, and Paul did call these men out for their treason. I love that you can walk with a balanced approach toward literature. I think these works can be very profitable, no less than works such as the Books of the Maccabees, and others we have no problem recognizing as valuable resources to learn much of long past eras. Still, I think we must tread carefully to educate and ensure young believers are aware that the Church has recognized inspired Scripture that must meet strict criteria to be considered the Word of God. I don’t suggest here that the Church determines and creates Scripture, but recognizes it. I think it was JI Packer who explained this by saying, “The Church no more gave us the New Testament than Isaac Newton gave us gravity. God gave us gravity, Newton recognized it.” The same is true for His inspired Word. I also don’t suggest to know where works like this (NNT) will go. Maybe no where. Maybe a lot of people become very confused and decide anyone can determine what belongs in the Bible. I’m grateful for these works being made available… in my quest to read everything ever written, it’s becoming to look as though I may fall a couple of books short. 🙂 Moreso, I’m grateful there are the many, as yourself, who don’t jump on the bandwagon to demonize everything that looks different. After all, it’s only rock and roll… Blessings and thanks CC! If the Church has lived by the current version all this time, I think we can stay with it. John 3:16. This is what I need and live for. True, very true. Thanks for the visit and comment.